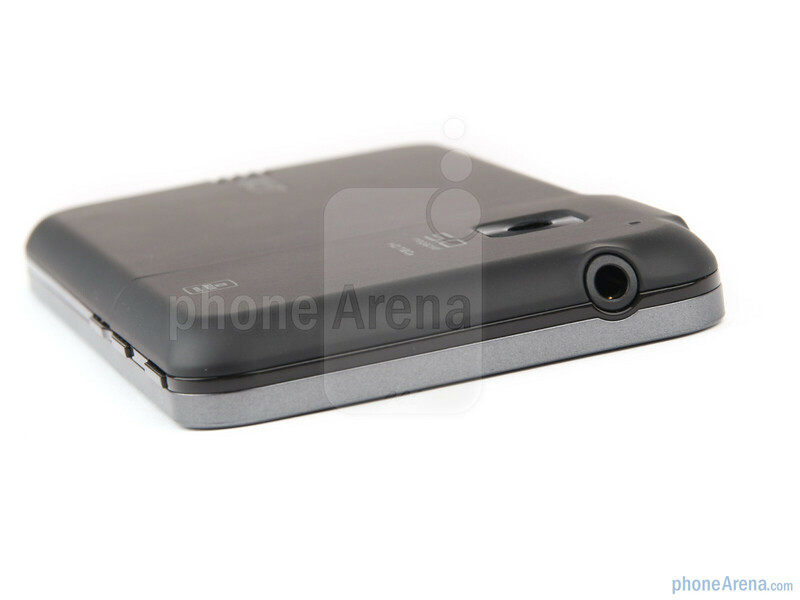 This is a global GSM phone, it can be used with AT&T's 3G network and T-Mobile USA's 2G network. 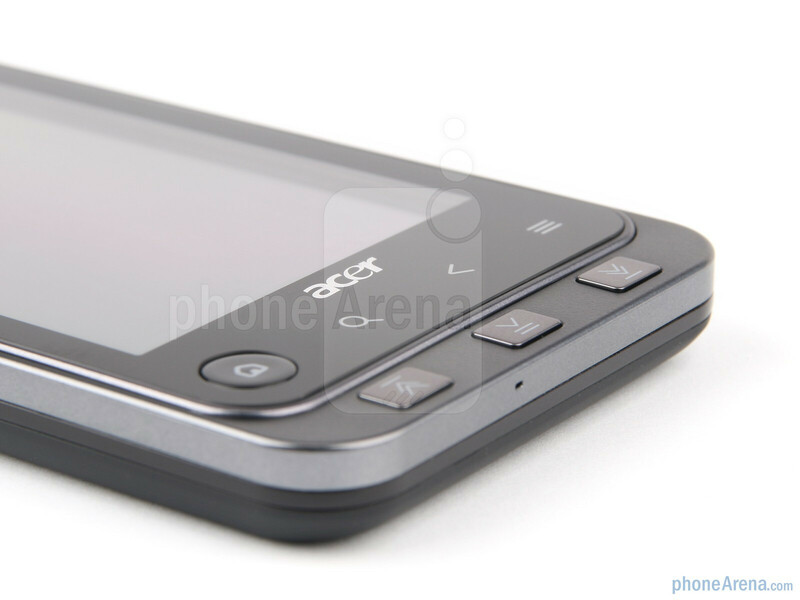 Acer's first heavyweight Android smartphone, the Liquid A1, did not really become a smashing hit, even though the company recently showed its readiness to support it by issuing an update to Eclair. 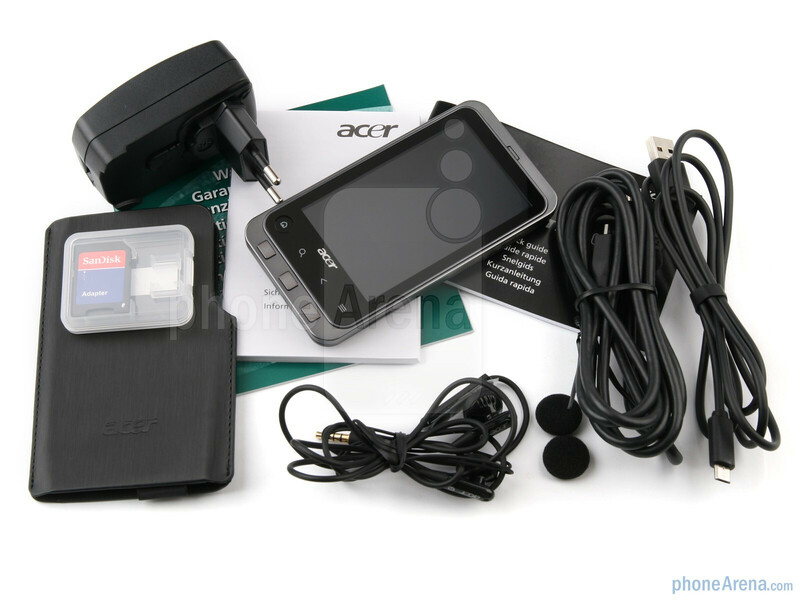 The lack of record sale figures though seems to haven't made Acer give up on the high-end smartphone business, as we now witness their second foray with the Acer Stream. 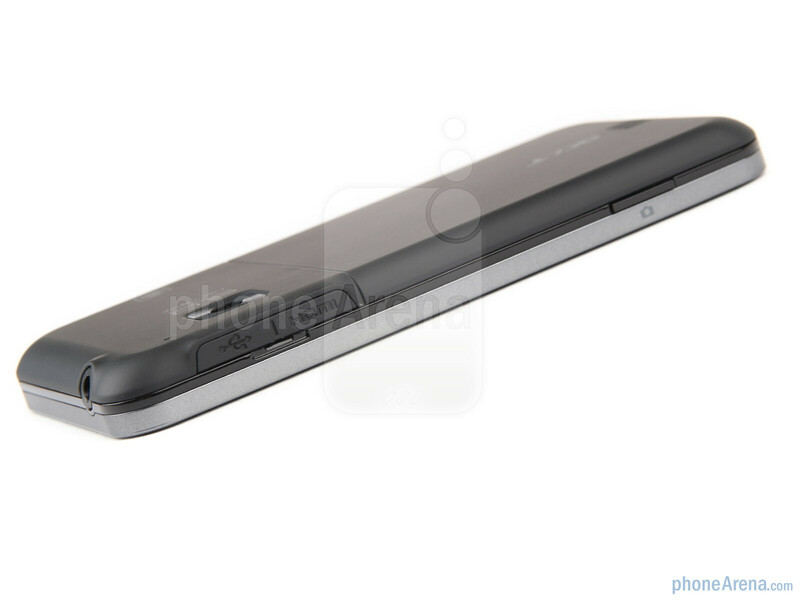 What do we expect from this handset? You know that in most cases the second-generation product is more mature than the first attempt. That said, Acer has already spent some time to feel the market and get into its rhythm, so we now feel it is about time for the company to come out with something impressive. As you see, the box is full of accessories and goodies that you'd otherwise need to buy additionally. Let's hope Acer has been just as generous with the realization of the Stream itself. 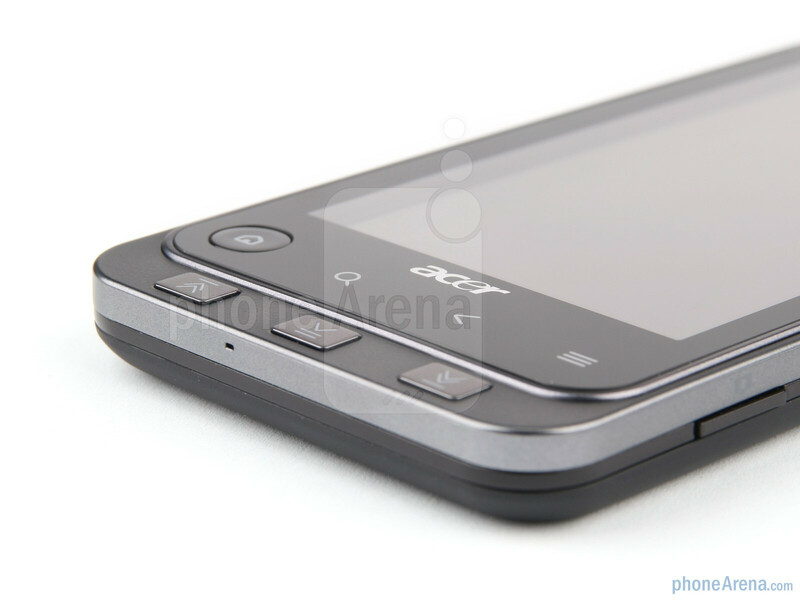 The Acer Liquid wasn't bad in terms of design, but wasn't anything unseen! 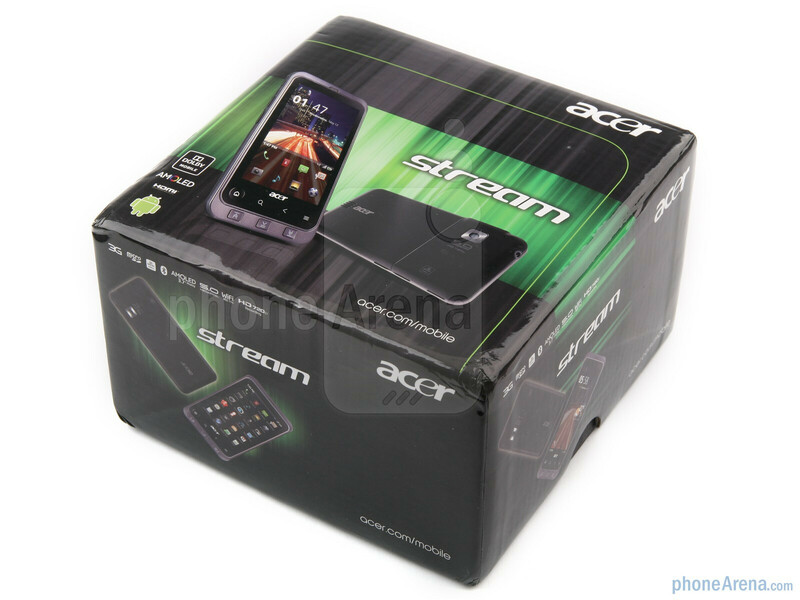 For the most part, the same goes for the Acer Stream, which however is a bit more off the beaten track. 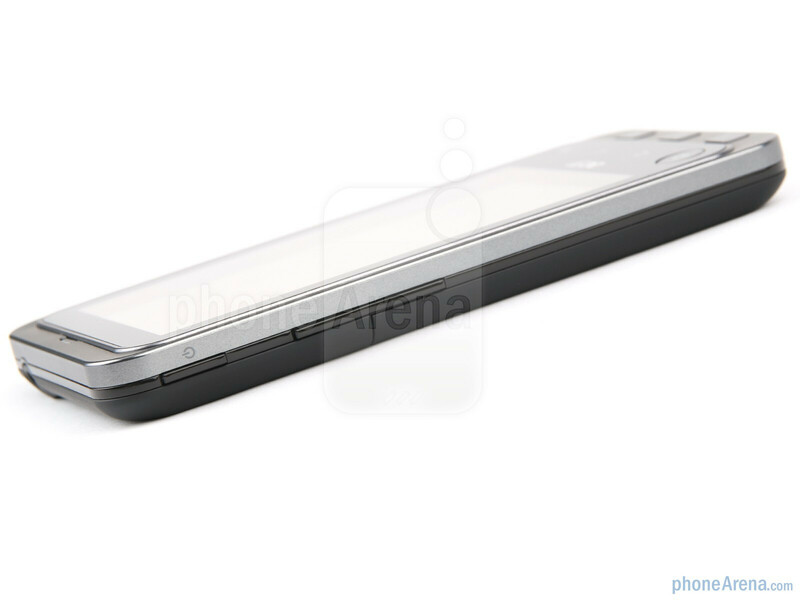 The handset has some rather masculine looks with its boxy design and choice of metal-gray plus black color scheme. Of course, there isn't something totally unseen with it, but it presents a breath of fresh air on the current market, where the letters H-T-C peek behind every corner. 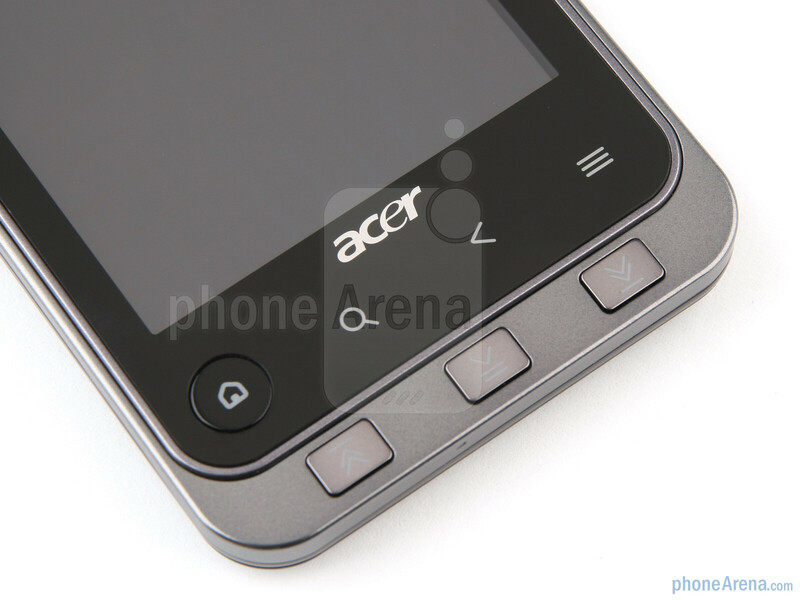 You can compare the Acer Stream with many other phones using our Size Visualization Tool. The 3.7-inch display is living up to the expectations with its impressive real estate, capacitive technology and WVGA resolution. It is also AMOLED (yep, that elusive AMOLED), but to tell you the truth, we are no longer ecstatic about this. Yes, you get your lush colors and good viewing angles, but being able to literally count the number of pixels on screen is not our cup of tea. Things get especially bad once you open a web page in the browser and try to read some small text. You'll be forced to apply a significant amount of zoom before you can read something in a relaxed manner. Viewing colorful images on the other hand is a pleasant experience thanks to those 16 million AMOLED-powered colors, so you'll simply have to decide what's more important for you. Text clarity or color saturation. Decisions, decisions. Take the phone outdoors though, and you'll have some pretty tough time figuring out what's on screen. We promise. Moreover, the panel seems to be a fan of fingerprint smudges. The Acer Stream is actually one of those rare cases where the interesting stuff happens below the screen. This is where you will find four navigation keys, namely Home (also serves as a notifications light), Search, Back and Menu. Now, Home is a normal tactile, physical key. The other three however are touch-sensitive, capacitive. A pretty unconventional design solution, which we don't mind. But there's more – below these four keys, you get three more buttons (all physical), which are your typical music controls - play/pause, next, previous. All of this has come together in a way that simply looks unique. This doesn't mean that it's going to win a beauty award, but it will surely generate its following. All of the above-mentioned keys work pretty well, and, for the most part, this applies to the volume rocker and power/lock key that are on the left side as well. On the top is the 3.5mm jack, and on the right are the microUSB and HDMI ports, hidden under a single flap, as well as the two-stop camera shutter, which doesn't have the most pronounced travel. 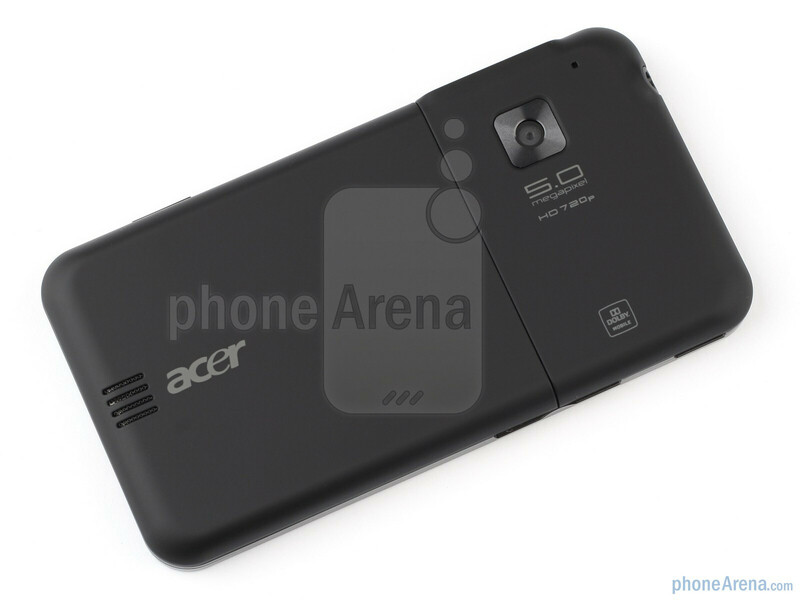 Flipping the Acer Stream over reveals a soft-touch-coated backside and a 5MP camera without a flash, but with HD 720p video recording. 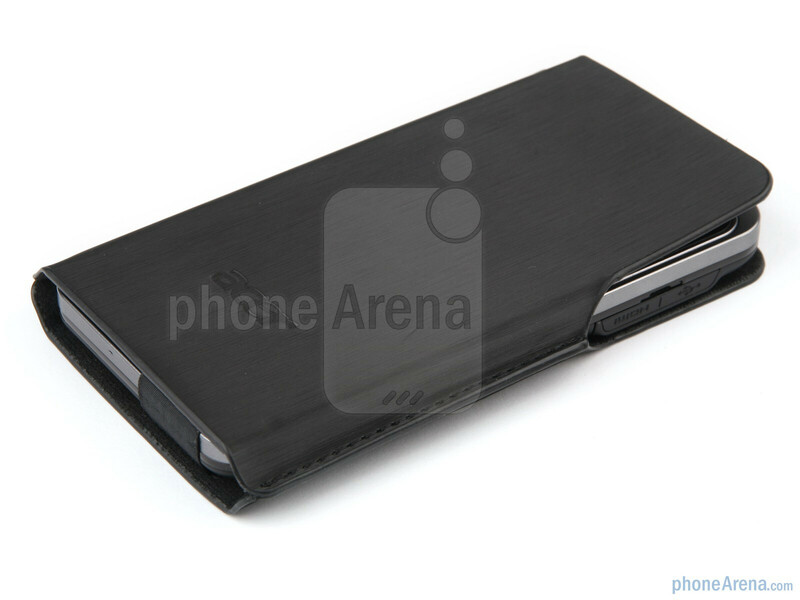 Should you remove the back cover, you'll gain access to the 1400mAh Li-Ion battery, which has to be gotten out of the way in order for you to be able to install SIM or microSD cards. By the way, our unit came preloaded with an 8GB microSD - nice touch. 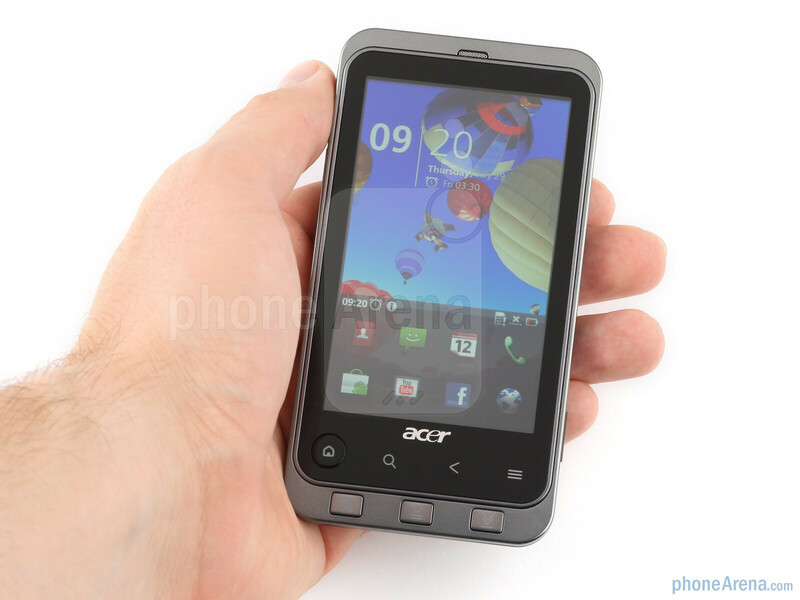 Overall, the Acer Stream feels good in the hand (seems like we've gotten used to holding BIG phones), while its plastic build seems reassuring, though not really premium. Still, it would have definitely been nicer if it was just a tad more compact. It is possible to operate the handset with one hand only, if you stretch your fingers a bit, but it's way more comfortable if you use two hands. Acer is finally getting the right idea.